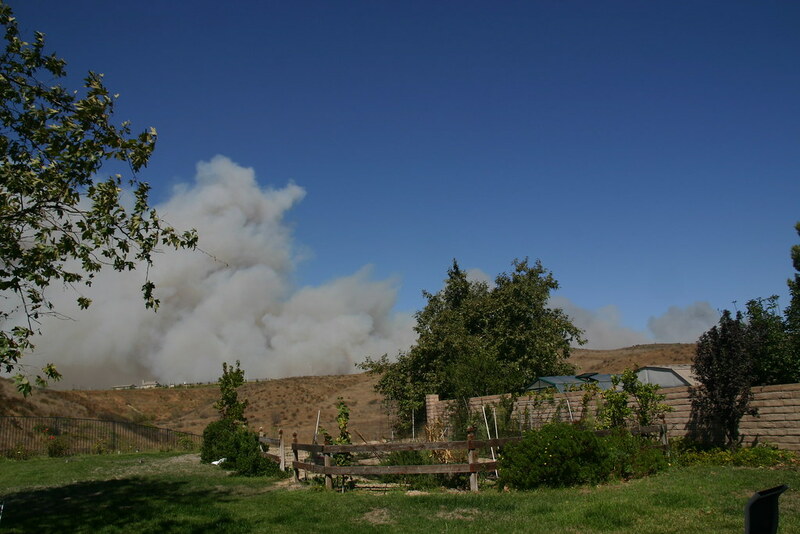 Everything is under control now, and the smoke smell is practically gone. Thank you to all the firefighters who worked so hard to keep everyone safe. On to loom news. It took a little over 3 hours to get there (damn you LA traffic) and 4 hours to get back home (double damn you LA traffic). I found out that the loom does NOT fit in my trunk. Okay, it does, but only if I don’t want to completely shut the trunk lid. Another 2 inches and I would have been golden. We tried it every which way and it just wouldn’t work. I was almost resigned to tying down the lid when I decided to try the backseat. It fit without a problem. Go figure. Here’s the worst of the damage, which has already been cleaned up to the best of my ability. I can handle the spots. Otherwise, it seems to be okay. There aren’t any cracks in the wood, the heddles are in great shape, there’s minimal rust on the heddle bars, and there was only a slight bit of rust on the ends of the 10 dent reed. It is missing the harness cables. I went to the store and bought 25 feet of vinyl coated metal cable and some cable clamps. It’s practically the same stuff I’d get from the loom maker, only it’s green (yuck). It might be a little thicker too. If it doesn’t work, I’ll order new ones. If it does, then I’ve saved $20. When I went to look at the loom, she had a garage full of weaving things. Shuttles, reeds, 2 table looms, 2 swifts, 2 other floor looms, raddles, and so on. I asked if the other things were for sale too, which they were. Only not the warping board. Nor that awesome table loom, it was hers for workshops. Now I’m thinking maybe I should get a table loom for workshops instead. I started looking at table looms and found what I think would be a nice one to have. It’s a Woolhouse Tools Carolyn. It folds for travel, has 8 shafts, and the levers are in the front. It’s lighter than the floor loom. So now I’m lusting for one of those and keeping an eye out for a used one. Good grief, will I ever be happy? Is it just the thrill of the hunt? I need an intervention! I’ve been keeping all my Atlanta friends in my thoughts due to the amount of rain they’re getting. I learned this morning that the roads were closed in the area we lived in when we were in Marietta. I remember the small creek that ran behind the house, though there was hardly ever water in it. From the sounds of it, there’s probably water in the house we used to live in. That’s the Filmore fire. 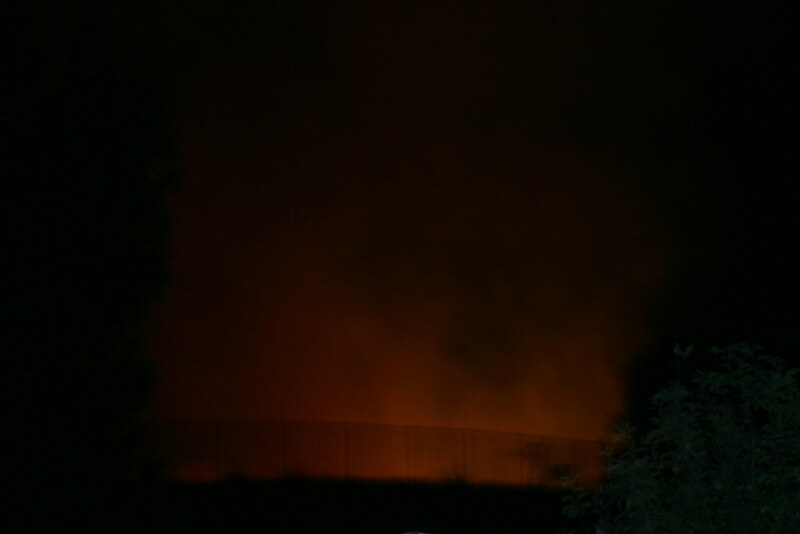 It’s still a distance from us, but it’s always kind of scary to see the smoke like that. It seems a lot closer than it really is. Regardless, I’ve gathered some things up. A change of clothes, food for the pets, pictures, passports, etc. Hopefully we won’t need them, but they’re ready if we do. I can’t help but think… there’s no way to get my looms in the car! I had all intentions of winding a warp today. I also intended to mop. Instead, Sam came home early and wanted to play WoW. Now I don’t mind getting the mop plans interrupted and I don’t mind playing WoW, but I’d really like to wind this warp. So, guess who’s getting another loom. 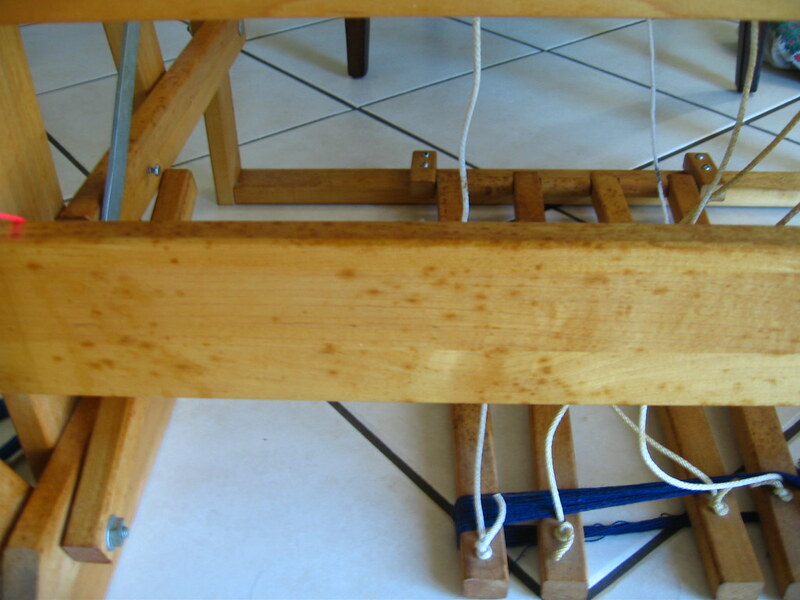 My first floor loom was a 22″ Harrisville 4s/4t. I’ve kind of regretted selling it because, after going to guild meetings, I realized it would have made a great workshop loom. Besides, it was my first loom and it taught me many things. I miss it. I’ve been keeping an eye out for another one, never in any hurry to get one right away, just when the right one came up. This one will need work, even more than the first one, and it too is missing a crank. (What is it with all the missing cranks? There must be a landfill full of them somewhere.) Pictures to come after I get it, which may be as late as this weekend. I said I was stubborn, not stupid. I was spending more time repairing broken threads than I was weaving. I’m not sure why I even bothered with the scissors. I could have just blown on it and got the same result. I have a huge cone of black 8/2 cotton that I bought for $3 a pound. A bargain, right? It would be if it was quality yarn. Winding the warp on the warping wheel, I suddenly found myself with an end of yarn. This actually happened 4 times. It didn’t break while I was winding. It was just the end. I didn’t know whether to be pissed that it just suddenly ended, or to wish they’d at least knotted it. Finding the beginning of the next strand was a pain too. At least with a knot, I would have known where the next piece began. I also found that it’s not spun well, at least I’m guessing that’s what it is. The yarn would be running through by fingers and next thing you know, I’d have a thin spot and the next part of the yarn seems bunched up. I continued winding it on to the loom anyway. When I was tying it on to the front apron bar, as I’m pulling on the tie to tighten it, several strands broke off at once. The 10/2 cotton I’ve worked with didn’t even do that. This yarn is not meant to be used as warp. But since I’ve got it on there, I’m going to weave it anyway. As much as possible, that is. 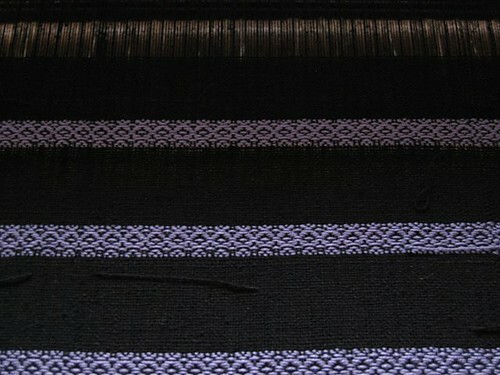 The light colored weft is lavender, even though it looks kind of pink in the top part of the photo. I don’t know if this yarn will be sturdy enough to hold groceries. A cereal box stuck in there the wrong way and the next thing you know, your tomatoes are taking a trip across the parking lot. And before someone even suggests lining the thing I’ll tell you right now that is probably beyond my sewing skills. Then again, I can be stubborn and I may just finish weaving it and line it, just so I can say I did it. Recently, there has been some discussion on warping back to front versus front to back. For the most part, people give their opinions in a civilized manner and everyone goes on their merry way. There always has to be one though. This one person made the discussions a little heated, on each and every forum/list they posted to. Apparently, if you warp front to back, you’re inferior. Or you have a loom that wasn’t made well. Back to Front is the ONLY WAY! Also, if you dare to look at one of the most recommended books on learning how to weave, you’ll be weaving-stupid for the rest of your weaving life. Because we all know once you read one book, you’ll never read another book again nor try to learn how to become better. Sheesh. Normally I’d probably go on my merry little way but these discussions came right before I’m going to attempt b2f warping so I paid a little more attention. In my opinion, everyone should warp whichever way works best for them. 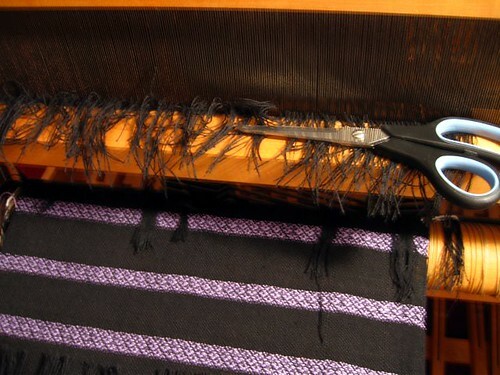 In the end, no one is going to look at your cloth and say “OMG you warped your loom wrong!” I’ll tell you this. There is a learning curve when you switch. Right now, I’m of the mind that it is much easier for me to warp front to back. Maybe it’s because the yarn is black. Maybe it’s because I’m using a 15 dent reed. Maybe it’s because this loom is different than what I’ve used before. (I refuse to believe that my Macomber or Gilmore are poorly made looms.) I don’t know. I do know it’s taking me forever and a day to get this warp on the loom. 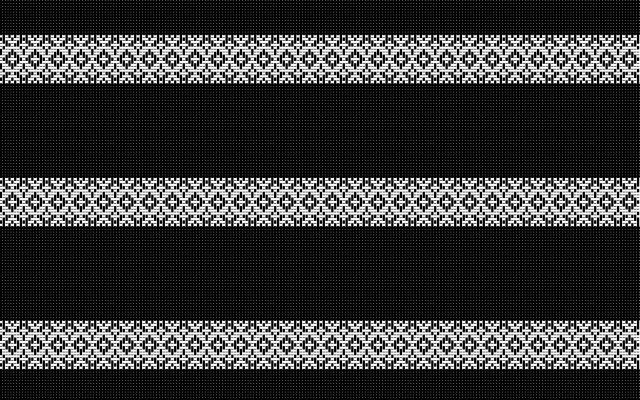 3) If I decide to do a strap that goes all the way to the bottom of the bag, I’ll have to find a way around those stripes. 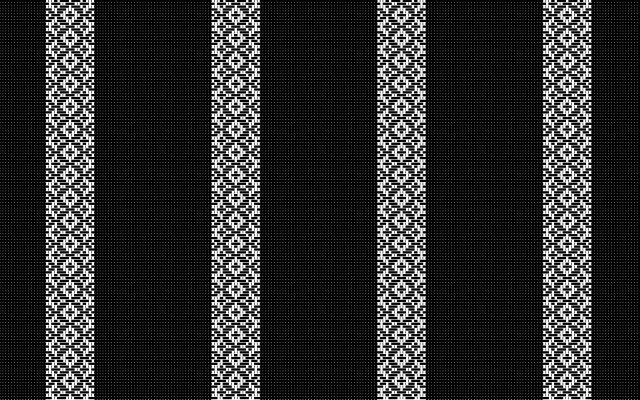 On the negative side, horizontal means I’ll have to change weft colors. In other words, more ends to weave in. Now to just find the yarn and colors.